This post is brought to you through our partnership with US Family Guide who made it possible for Evan to attend British Soccer Camp in exchange for our review and honest opinions. All opinions are 100% our own. Summer is almost in the books, can you believe it? Evan spent a week at British Soccer Camp honing in on his soccer skills as he prepares for the YMCA's Fall Soccer program. While we're still not clear which position he loves to play (because he seems to like them all), we are clear that he really loves soccer thanks to this program. This year was a 'lil special for the Bigs in a few ways. First, Evan was old enough to be at camp for the full day program, meaning Pappy took him at 9 and picked him back up at 4. He was also responsible for putting on his own sunscreen and eating his lunch - both of which he took seriously! Next, you'll notice I said the Bigs! Arianna went with Evan on day one for the "Bring a Buddy" day. While she still loves her softball, she's fallen back in love with soccer thanks to camp and will also be playing this fall! While Mama & Daddy didn't do the pick-up or drop-off, Pappy gave us the details. This year, the camp was at Denny Field in Shaler and it was five days of playing outside. There was a picnic shelter and the Soccer Club opened the concession stand, too. The coaches (from around the globe) were friendly and young, definitely committed to teaching the kids soccer skills! I stopped in to see the last day's World Cup game, but I missed it. They played a few World Cup games each day and on the last day represented their countries. Evan loved this. And just like we shared in our intro post about the camp, he got his jersey, t-shirt, and ball in addition to the skills and character building. We're so proud of him (and Arianna)! British Soccer Camps are the most popular soccer camp in the US. With an innovative curriculum that develops skills, speed and confidence in players ages 3-18, The British Soccer Camp provide boys and girls with the rare opportunity to receive high-level soccer coaching from a team of international expert's right in the heart of their own community. 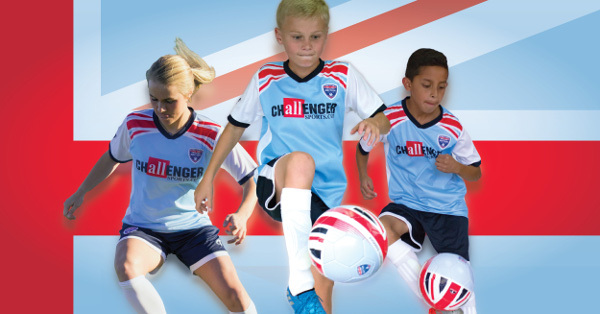 If you'd like to learn more about British Soccer Camp and save on registration in your local area, use code BSC18 on the Challenger Sports website.